OKAZAKI, Japan (CNN) -- At Spencer Morrey's home, there are two constant sounds: his dad, Craig, murmuring, "You're okay, Spence. You're okay, buddy," and the sound of a machine clearing the toddler's airway. Spencer Morrey, pictured with his father Craig, has severe cerebral palsy and requires 24-hour medical care. Both sounds come every few minutes, in between hugs, tears and kisses. Spencer has severe cerebral palsy and requires constant, 24-hour medical care. 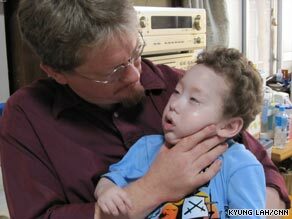 In Japan, a country that lacks sufficient medical services for disabled children, the only person to care for Spencer is his father. Morrey says his wife left, overwhelmed by the strain of their son's medical condition. That would be pain beyond what most parents could imagine. But Spencer's mother fled while pregnant with Morrey's daughter, Amelia. In more than a year, Morrey says he has only seen his daughter four times. "She wouldn't recognize me," Morrey said, with Spencer propped on his lap. "She wouldn't call me daddy. She's just starting to talk now. But she's not going to know who I am. I think she deserves my love. And I think she deserves to be with Spencer and Spencer deserves to be with her." Morrey, a native of Chicago and a U.S. citizen, was married to a Brazilian woman of Japanese descent. They divorced in a Japanese court. But in Japan, where only one parent gets custody of a child in a divorce, the family courts have left the case in legal limbo for a year because they have not decided which parent legally has custody of the children. Typically, the parent with physical custody of a child retains custody. He is afraid that if he heads home for the U.S. with Spencer without that, he could be subject to international child abduction laws, and he also fears such a move could hurt his chances of getting the Japanese family court to give him joint custody of his daughter. Morrey has been forced to quit work to care for Spencer. The financial strain of living off his credit cards is adding to the stress of caring for a disabled child alone in a foreign country. Despite his pleading with court mediators and repeated court filings claiming that joint custody is the law in both the U.S. and Brazil, Japan's slow and antiquated family courts have let the case languish. "Kids need both parents," Morrey said. "Whether the parents are married or not is irrelevant in my mind. The Japanese courts, and I realize you're going against years and years of cultural differences and everything else, but they don't care about the welfare of the child. "In Japan, it's considered too messy. It's too complicated. It deals with personal feelings, so they don't want to deal with it. So the best way is to not deal with it." CNN contacted Morrey's ex-wife four times by telephone and once by fax. She declined to discuss the case. The International Association for Parent and Child Reunion believes there are an estimated 100 American families in situations like Morrey's in Japan and dozens involving those from Britain, France and Canada. One of those cases is that of American Christopher Savoie. Savoie drove his children to the nearest U.S. consulate in the city of Fukuoka to try and obtain passports for them. Steps away from the front of the consulate, Japanese police arrested him. Savoie is now in jail, awaiting a decision by prosecutors on a possible indictment. Savoie and his first wife, Noriko Savoie, were married for 14 years before their bitter divorce in January. According to court documents, she fled with the children to Japan in the summer. A U.S. court then gave Christopher Savoie sole custody of the children. But Japanese law recognizes Noriko Savoie as the sole custodian, despite the U.S. order. "It's like a black hole," Morrey said. "If you go through a divorce, there's this joke. If you have an international marriage with a Japanese, don't piss them off because you'll never see your kids again." Not seeing his daughter Amelia again is what is keeping Morrey in Japan. He has been selling off everything he owns, trying to keep himself and Spencer afloat, hoping the Japanese court will bring him some legal connection to his child. He is stuck choosing between caring for his son, who needs the better resources of the U.S., and hoping to be a father to his daughter. "How do you make that choice? It's not -- once you're a dad, you're always a dad."